How Have these Rays Adapted? Manta Rays' ancestors were flattened from top-to-bottom. So, they also have close to the same shape. Derived from Stingrays (which are considered bottom dwellers), their evolution changed some things about them. Their pectoral fins, developed into graceful, wing-like appendages, while their flattened body shape was kept. They did lose the stinging barb that is associated with the bottom-dweller type of rays. Mobula Rays- There are 9 species of these rays known, and they also have cephalic lobes that are shaped like paddles. In addition, they also have curved wings of grace. The difference between these rays comes when you look in the mouth region. Mobulas have a mouth that is considered sub-terminal. Sub-terminal mouths are mouths that are under the head region in most Chondrichthyes, such as sharks. Manta Rays -There are only 2 species known for the manta ray, and they also have cephalic lobes that are shaped like paddles. Their mouths are considered terminal, because they are located at the front of the head. This helps greatly with filter feeding krill, plankton, and other small fishes (typical fish that are bony, and are found in schools). + The Manta Ray's body and mouth are quite adapted for feeding. It has two fins, called Cephalic fins, on the front of its mouth. When these fins are positioned just right at an angle, prey are funneled right into their huge mouth. 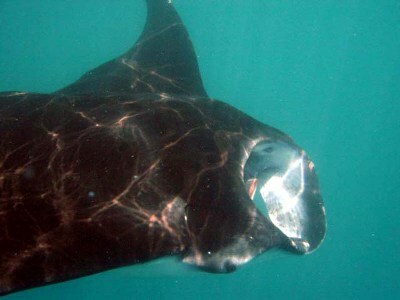 + Mantas generally feed at the surface (where plankton and krill are in large numbers), or at least near the surface. + They are also said to feed more heavily at night, when krill and plankton numbers are up. Let's take a look at where the Manta Ray inhabit.